Wiyaka Sinte Win or Tail Feather Woman, a Dakota woman who had a vision about the construction of a great drum, designed “to bring unity and healing” among peoples, is to be honored this year by Dakota people. Sometime after 1862, Tail Feather Woman, who is usually described as being Santee, or simply Dakota, was living in a particular village when it was attacked by “blue coats”–American soldiers. She took refuge in a swamp, hiding there for days, sometimes under the water so as not to be seen, breathing through a hollow reed. During that time she prayed for deliverance and she received a vision about the construction of a drum the beat of which had a transformative power that would lead the blue coats to lay down their arms. Tail Feather Woman’s vision led to the construction of many drums in the late 19th century, made by Dakota people then passed on along with the vision and its teachings to Ojibwe communities in Minnesota, who later gave drums to other tribes farther east, such as the Menominee. Today these drums continue to be used in ceremonies and in celebrations. A number of Ojibwe communities today tell the story of “when the Sioux brought the drum.” An 1878 newspaper, as I tell in my book We Are at Home: Pictures of the Ojibwe People, told of a gathering of people at Pine City, where one such drum was given. Although the article implied that those gathered were massing for an attack on white communities, it also recounted Tail Feather Woman’s vision in detail, making plain that her teachings were designed to bring people together in a time of hostility and distrust. 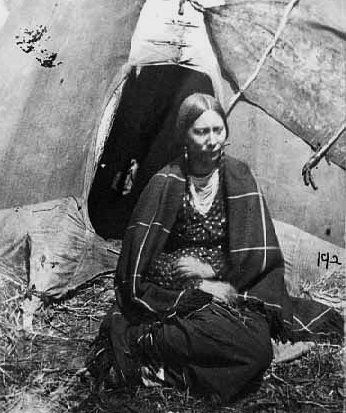 A Dakota woman held captive at the Fort Snelling concentration camp during the winter of 1862-63. The tragic events of that time led to several decades of conflict between Dakota peoples and the U.S. government, during which time the experience and vision of Tail Feather Woman took place. This photograph is in the collections of the Minnesota Historical Society, which has many photographs of Dakota people taken at the Fort Snelling concentration camp. While attending Red School House [in St. Paul] in the late 70’s and belonging to the Three Fires Drum Group, we – as Young People from various tribes, were invited to a Big Drum Ceremony at a Long House at Round Lake in Wisconsin. The People at the ceremony were made up of mostly Anishinabe Elders, all fluent, with a Huge Drum in the Center. The long house had a light coming from the hole in the roof, which was shining and moved with sun movement on the Drum. This particular Big Drum was Huge, with four staffs in the four directions, hanging from the staffs were painted hands in different colors representing the direction. The ceremony consisted of various songs, as the light moved in a certain area across the drum, which seemed to indicate a certain song to be song. This ceremony is very private, a healing ceremony, with Societies that exist today with the mentioned Nations. Tail Feather Woman was by her camp gathering food, when the Blue Coats invaded her village, there are some versions that say she told the Anishinabe that her four sons died in the invasion, some do not mention this, in any case, she ran for her life from the Blue Coats who were on horse back. She dove in the lake and thought quickly enough to grab a reed to breath through and began to hide under the water for a long period of time, some say over night, some say for four days, in which case, it was very long for hours on end… While under the water, she prayed and was visited by the Creator, who gave her a vision of the Big Drum. It is said she told that the pounding of the drum is to bring healing for the People and bring them together in unity. The Big Drum ceremony that is carried on with the Anishinabe, say it is a great Healing ceremony for their People. After the Blue Coats camped and waited for her to come up. Tail Feather Woman arose from the water by the calling of the spirit and the crying of her family, where upon she was able to walk through the camp of the blue coat soldiers, unseen. Tail Feather Woman was invisible to them, she walked through their camp and was able to take some of their food and walked across the plains to find her family. Exhausted and ill, she looked for her family, until she found them, they nursed her back to health and she told of her experience and vision. As directed by the Creator she headed east in gratitude with her family she passed on the vision, along with the songs and protocols for the ceremony to the Anishinabe. This ceremony still exists today with many Societies. She later died while living with the Anishinabe Nations. So we remember Tail Feather Woman, a unique name, as it is the part of the eagle that is used for any of our ceremonial rites, you need that eagle tail feather to participate in most of our seven sacred rites, a powerful name. She was one of our Nation’s women that survived a tremendous feat, through strength and endurance, earning a powerful vision of healing. We should not allow her memory to die with her own people or rather; this story should be reborn to her People that she lived in honor of our people. Her memory lives on with the Anishinabe Nation; there is even a Tail Feather Woman’s Society. It is said that throughout History there are great Leaders that are men, but seldom do we remember a woman. All women are sacred and remembered as a whole for what they gave as the ‘back bone’ for the People, but her remarkable feat deserves this honor; she had to be a very strong woman to have survived under water that long and be sincere enough in prayers to be gifted a great vision of healing that is being done to this day. We need to remember her and honor her.